The EU-Vietnam Free Trade Agreement was concluded in December 2015. The agreement is EU’s second free trade agreement with a Southeast Asian country (after Singapore) and is the most ambitious and comprehensive FTA that the EU has ever concluded with a middle-income developing country. Statistics from the Eurostat show that Vietnam was EU’s sixth largest extra-region apparel supplier in 2015 (after China, Bangladesh, Turkey, India and Cambodia), accounting for 3.5% of imports in value (or €28.0 billion) and 2.8% in volume. The EU-Vietnam free trade agreement is expected to substantially expand Vietnam’s textile and apparel exports to the EU market. 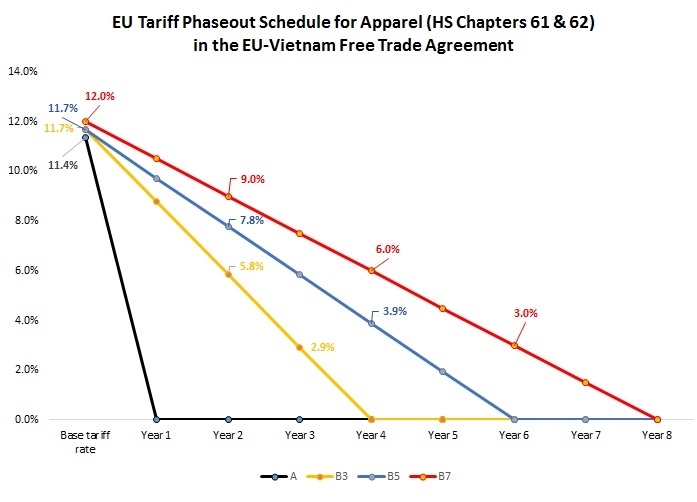 On the one hand, EU’s import duties on textile and apparel from Vietnam will be eliminated through a seven-year phaseout period once the agreement comes into force (see below). On the other hand, a garment made in Vietnam which contains fabrics made in South Korea or other ASEAN countries with which the EU has a free trade agreement in force will still be qualified for duty-free treatment under the agreement. Complied based on the EU-Vietnam Free Trade Agreement: Agreed text as of January 2016. The legal review of the negotiated text is currently on-going and will be followed by translation into the EU’s official languages and Vietnamese. The EU Commission will then present a proposal to the Council of Ministers for approval of the agreement and ratification by the European Parliament. The agreement is expected to come into force in 2018.